Russell Eponym Sings in support of the SL Music Races for a Cure Art Faire & Auction – today at 2 PM SLT – Ce Soir Arts – Be inspired tonight! 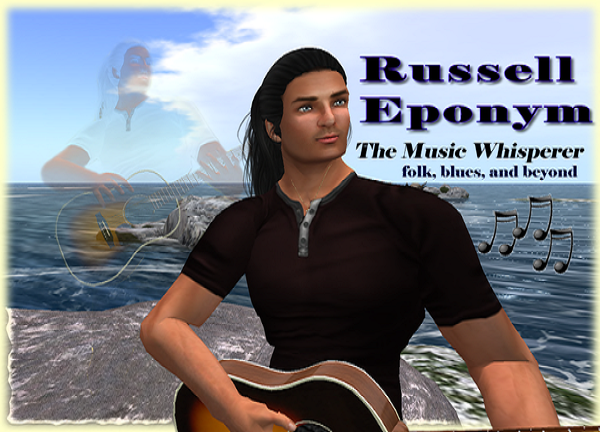 The inimitable Russell Eponym will land at The Conservatory at Ce Soir today at 2 PM SLT to delight us with his enchanting mix of music known as folk, blues, and beyond. Donating his time and talent to the cause of cancer awareness and the raising of funds to benefit RFL of SL as the SL Music Races for a Cure Art Faire & Auction continues, Russell is all set to bring us more of his exceptionally enjoyable music, a growing collection of historical folk tales set to music and his own lovely compositions. Lyrically beautiful and musically rich, the Russell Eponym sound invites the listener in. Sweet melodies and toe-tapping tunes showcase his unique finger-picking guitar style, his velvety voice, and his talents with the harmonica, banjo and even the kazoo! From dreamy love ballads to songs that will tickle your funnybone, Russell has them all. Add to that the delightful Eponymous family of friends who often gather to enjoy his music, and you are in for a charming hour indeed! Come enjoy the art – and do bid on your favourites (see my last post for more details about the Art Faire & Acution)! The music will enchant and the art will please, so we’ll see you here! Previous Big Day! SL Music Races for a Cure Art Faire benefiting RFL of SL opens at The Conservatory at Ce Soir Arts! 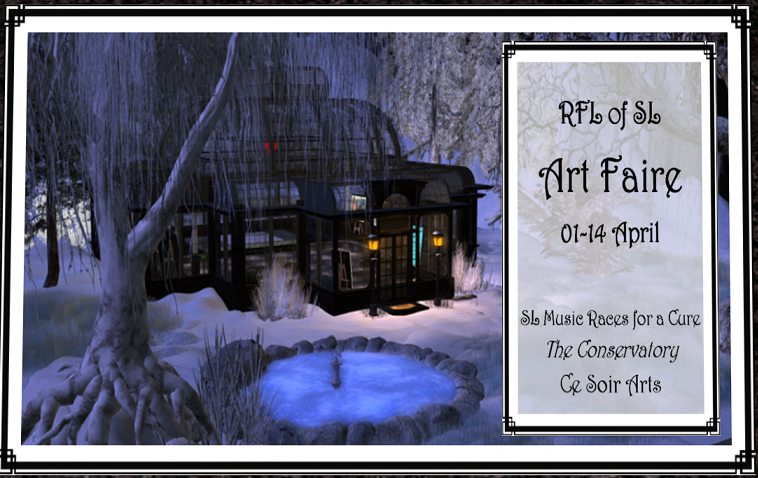 Next Update: Poetry fills the air at The Conservatory for SL Music Art Faire for RFL of SL – Saturday!